I have had made hundreds of friends in Pakistan motivated by my bond with my first Pakistani friend Atif and which I cherish a lot. Among many people, I met a man from Punjab (Pakistan). His name is Talat Islam Khan whom I call as “Tali”. He is of my age and a great friend of mine now. We met each other through Facebook just 3 months ago but our friendship did not take even a minute I think! We share a lot in common. Most of the feelings, thoughts synchronizes between us and seriously I often ask him, “did you ever read my diary?” He think of us as the same soul in two bodies and I so agree with him! We have a lot of common things including our stance on Indian Pakistani friendship, bollywood, southern films, music among other things. He is a great entertainer indeed. He is a mimic artist, actor, singer…well he’s multitalented! The best thing I like in him is the way he speaks. He is a great follower of philosopher Rumi and through him I came to know about the great person. His thoughts are also so fine just like Rumi. I feel that Tali is a brother from another mother to me! I feel that I owe him a lot. He is good at philosophy and he guides me in many ways. He respects our friendship and whenever we find time, we speak for hours or so through whatsapp and messenger. There is a saying that I really like – “Unexpected friendships are always better”. I think I understood it’s meaning because of this fellow. Yes, there were many stereotypes that tried to break our friendship. I was asked not to speak to him and to avoid this friendship. But I had made up my mind. Even if I will have to delete 99% of my Pakistani friends, I’ll not unfriend some and Tali tops that list. It’s hardly few months and we both believe that we are kind of brothers. My parents know him and his mom know me. That’s how he’s popular in my home too! Coming to people’s reaction on our friendship, as usual many were and will be surprised and shocked to know about our bond. I had uploaded a video about our friendship on Facebook a few weeks ago wherein I shared about our friendship and the value he has in my life. To my surprise, I got good comments not only from Pakistan but also from my fellow Indian friends. They appreciated and agreed that it will be great if we all start thinking this way and to reach out, form bonds with people who are regarded to be “different” and “opposing” to us. There are plenty of similarities among Indians and Pakistanis. Once we clear out all our attitude and speak to people who are from the other side of the border, I am sure that we will be able to see a lot of changes. As a common saying goes this way, to solve a problem, speak WITH each other and not speak ABOUT each other. I hope once people will come together, all these stereotypes and myths could be broken off. This year we gonna celebrate 2017 New Year as virtual brothers and I hope that we are able to celebrate the next year together! “This story is about me and my best friend, Atif. I am an Indian Christian and he is a Pakistani Muslim and this didn’t stop us from being best friends! I still remember the date when we met on Facebook. It’s well-etched in my mind. It was 4th July 2013. We had met through an online game on Facebook. I felt like adding him and asked him if would be fine with us being connected on Facebook. He readily accepted and thus, began our journey of friendship. Day by day our friendship became stronger and with time, we became brothers! It’s about three and a half years now. Our love, friendship and bond of brotherhood still remains the same. Moreover it is increasing day by day. He has always been like a mentor to me. He has seriously influenced me in many ways in my life! We shared a lot and understood that we people are no longer different! Our friendship grew from Facebook web, passed through apps like Whatsapp and now it stands with Whatsapp video call and Skype! He is well popular among my friends in India. Initially, I did face a lot of stereotypes and misconceptions, with few even bashing our friendship. I never gave serious thought to the negativity and cherished our friendship and I am glad I did! He was my first Pakistani friend who helped me in understanding Pakistan and Pakistanis. He showed me how an ordinary Pakistani is. Now my friend list has about 1000+ friends from Pakistan. Still he remains the best friend both in real and virtual world! We celebrate Eid, Christmas, New Year, our birthdays in virtual world! We have never missed any special day and all goes with laughter and joy! The only thing that I aspire is to meet him in person now. I really hope that it happens soon! I am awaiting any opportunity to travel to Karachi to meet him. I am from Rahim Yar Khan city in Punjab province of Pakistan. I was born in Paris but lived most my life in Pakistan. 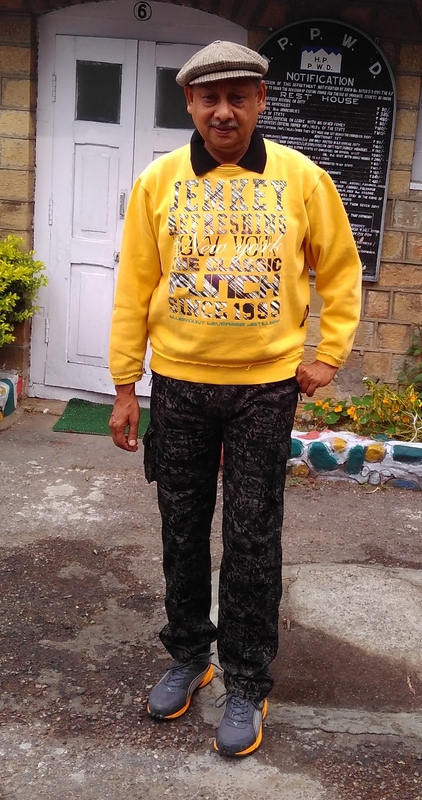 My friend Pratyush Pandey originates from Lucknow in India but currently resides in Hyderabad (India). We met in 2009 and studied BBA (3 years) in Paris School of Business. Today, I am considered like a family member by his family. We celebrated all religious events together. He use to fast every Tuesday and to respect that I wouldn’t drink nor eat during all our time together. Well that’s all mutual respect. Multiple times he visited mosque and I visited Temple with him. We wholeheartedly respected each other traditions and norms which can be concluded by saying that “we taught and learned from each other”. We both faced stereotypes in our own inner circle like his friends from India and my Pakistani friends would question my friendship and we use to tackle those with strong condemnation and later would laugh discussing those discussions. During our 3 years tenure, India-Pakistan played few matches and every time we use to invite our friends and watch it all together or planning night outs. Our friendship did managed to bring our other Indian Pakistani friends closer as well. Together we made trip to Amsterdam, organized university events on Eiffel tower and roamed around Paris like it must be toured. I think it’s all about the environment in our respective country. Indians and Pakistanis who have traveled abroad have no complain meeting and even working with each other. Middle East is the biggest example where millions of Indian and Pakistani mostly work, share apartments and even dine together. It seems so unfair when same people living in their own country criticize/blame the neighbor country for any on-going event. All Indians and Pakistanis must be given chance to travel and have some experience in order to actually understand the true meaning of humanity by staying humble as we share same culture, language and interests. I feel sorry for people who have spent whole life around their own countrymen, community and accordingly they developed the hatred engulfed through the environment, political system. Europe has seen world wars yet it’s countries managed to put all past behind by demolishing borders and united to develop economically, socially and culturally by allowing flow of people traveling to other countries even though most countries have different languages. Why can’t India and Pakistan follow Europe and set aside the past as both countries faces same issues of poverty, terrorism and development of rural areas. Both countries are wasting billions of dollars on military upgrades which seems useless since both countries are nuclear states. Ultimately it’s the civilian paying the real price at the hands of politicians who secretly maintain healthy relation (Modi-Nawaz Nepal meeting, Modi attending Nawaz’s granddaughter wedding) but on front tend to ignore dialogues which can least pave way for stability in both countries. We as nations are the main culprits for the unstable neighbor relation allowing our selfish policy makers to keep stretching the border line. Relationship between both countries can only develop when each individual of both countries show some optimism and humbleness towards each other. Follow your own heart instead of news. “I met Abha last year when she came to Lahore (Pakistan) for a training on adult education which was being conducted by the organization that I am part of. Abha is a certified trainer for Play for Peace. She belongs to Solapur in India. Currently she is working for Dalit community in collaboration with CSEI. She has such a strong and charismatic personality that I never felt that this was my first time to meet her. We became very good friends in just 15 days, in fact from the very first day. When both of us along with our other friends were roaming on the roads of Lahore, our laughs were the loudest. We have discussed almost everything during those days from patriarchy to peace. She is my strength and also my love guru 😀 as she always told me that heart breaks and breach of trust may happen a lot but will heal eventually. She has taught me so many things including how to wear a sari and how important it is to be yourself. 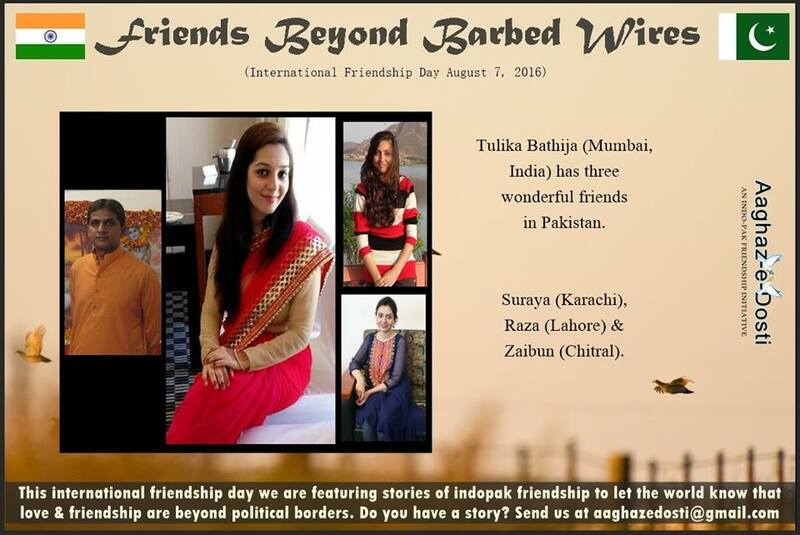 As part of our call to share about their friend(s) beyond the Indo-pak Border, Tulika Bhatija, an Educator and Peace Builder shares her story of friendship with Suraya Islam, Zaibun Nisa Hussain and Raza Khan from Pakistan whom all she met as part of her peace building activities between India and Pakistan. I met Suraya Islam first time on Skype, along with my students at Ecole Mondiale World School. Our conversations about cricket, partition and flavours of both countries were filled with humour and interesting insights from both sides. Suraya led the discussion with flair, maturity and helped her students reflect on their thoughts and interactions. I learnt so much from her that day. A few months later, I found a gift on my coffee table, with a note attached to it, ‘To our favourite teacher, With Love, Karachi.’ I was very overwhelmed to receive the Ajrak from Sindh; it was strangely nostalgic. Till date, I keep that note in my purse, and think of my wonderful exchange with Suraya. 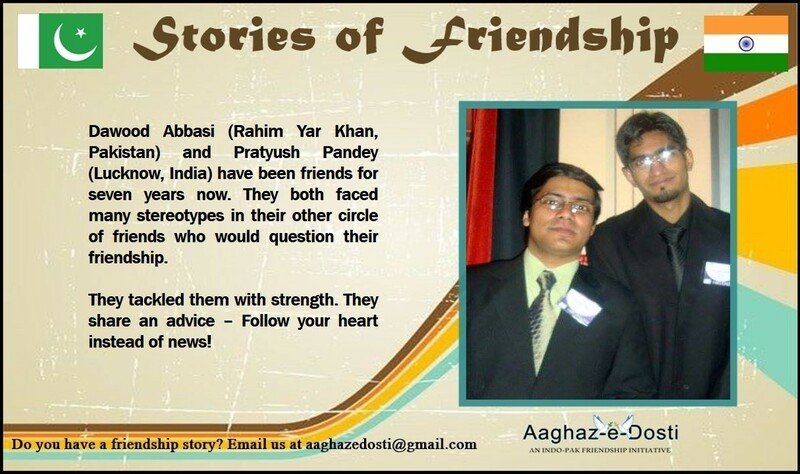 Raza Khan and I were introduced through Aaghaz-E-Dosti in the aftermath of the Lahore attacks. We have exchanged stories of peace, pain, sorrow and trials and tribulations of being teachers. I can never imagine what it feels like to teach in a school where children have lost their very own. I am very fortunate to have met someone so passionate and determined like him. He continues to grow as an educator and is always to open to learning and sharing ideas. “From our childhood we learn that India is our enemy. But Is it really? okay let me tell you my story. It started when a girl named Selena took admission in our school SLS. We came to know that she is an Indian and she really hate Pakistanis. And a question emerged in our minds that why? Why she hate Pakistanis so much? She was new admission and she didn’t know about our school’s rules and regulations and so we told her that if she needs any help then we are here for her. But she was so rude and arrogant. She said “No! I don’t need help of any of you. I don’t want to take help of you Pakistanis”. And we said that okay if you don’t need our help then we wont. After that day I used to hate her for the way she is and I started to think that she is my enemy because she is an Indian. We both used to hate each other. But one day our school got threats from terrorists and they said that they are going to shoot every Indian in our school. The principal announced that school will be off for two weeks because of the threats. She got so scared and started crying. Our heart melted when we saw her crying in a corner. Then me and my group helped her and we sympathized with her, told her not to cry and that everything will settle down soon. We assured her that nothing will happen to her. We were the ones who helped her in her bad time and then her thoughts changed towards us. Soon she was so embarrassed about her arrogant behavior. Then she became a member of our group and as time passed our friendship got closer and today its been 3 years and we all are still together. THE BEST FRIENDS! 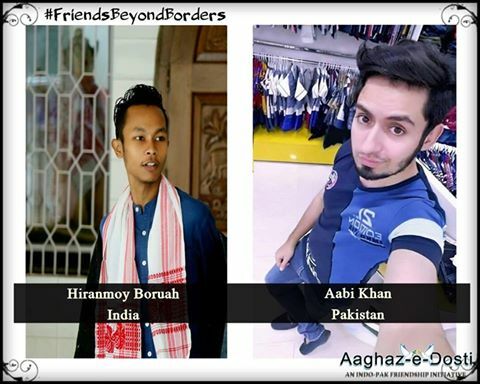 As part of our call to share about their friend(s) beyond the Indo-pak Border, Hiranmoy Boruah from Assam (India) and Aabi Khan from Rawalpindi (Pakistan) share their story. “Both of us were die hard Big Boss fans. It was last year, during the course of supporting the same celebrity contestant Mandana Karimi, that I met Aabi Khan. Another Pakistani friend of mine had created a facebook group to support Mandana Karimi, to which I was added. Aabi’s reaction to one of my posts was the first time I got to know about him. After this we became friends on facebook but due to some reasons, did not interact. Big Boss got over. It was hard for us to accept Mandana’s defeat. But, eventually, things became normal. I started following his posts and came across some inspirational and heart touching posts on his timeline. They were so relatable. I could literally see myself. I have been through the same phase. Exactly the same words I wanted to convey. You can check. We even have two common profile pictures and one common cover picture. And this is what made me take the first step and say ‘Hello’. Now we’re very good friends. We talk about our hobbies, passions and of course about our countries. We care for each other. We support each other in need. He teaches me Hindi and Urdu. (Though I’m from India, my Hindi is very weak) and I tell him about the beauty of India, about our culture and the unexplored paradise that is North-East India. 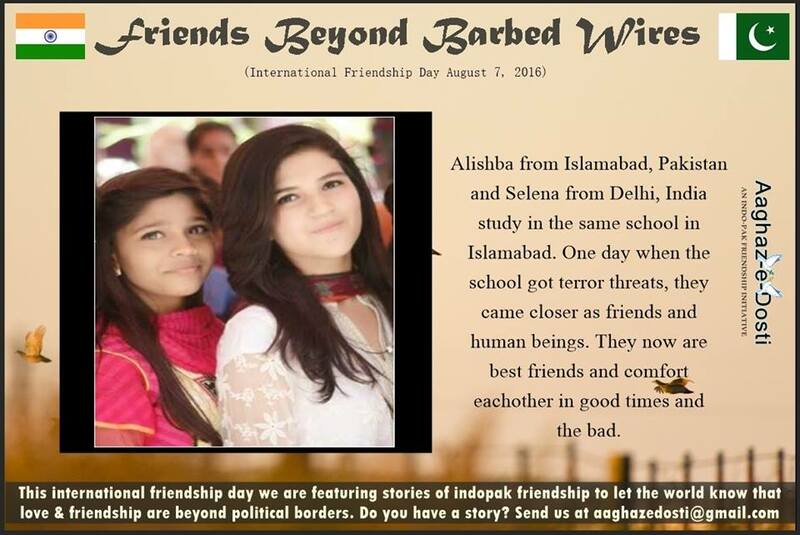 Here we publish the friendship story of Devika Mittal (Delhi, India) and Aliya Harir (Islamabad, Pakistan). Devika Mittal is convener – India of Aaghaz-e-Dosti (May 2012 – Present). Aliya Harir served as convener – Pakistan (October 2013-May 2017). I met Aliya Harir through a mutual quest for indopak peace. In August 2013, I saw on the Aman ki Asha facebook group an announcement sharing that Aliya was organizing a peace painting event at her university. As I was a part of similar peacebuilding initiative (Aaghaz-e-Dosti) in India, I approached her with a request for collaboration, and she instantly agreed. While we began on a professional note, it did not take us long to become friends — the reason being a special bond that connects Indians and Pakistanis instantly in a positive way. We are way too similar, and always have just so much to talk about. It has been more than three years of friendship. Now when we come across cultural similarities, we are hardly surprised. My friendship with Aliya is no different than the bond I share with my friends here in India. In fact, with some of my friends in India, I am still very formal in the way I speak. Exchanging friendly abuses is something that I don’t indulge in with them. But with Aliya, there are no such boundaries. We exchange friendly abuses quite freely, and also learn new ones from each other. It is all in the spirit of fun. Working for indopak peace through Aaghaz-e-Dosti, and having friends in #Pakistan, I had always wanted to visit Pakistan. In November 2015, I luckily got an opportunity to visit Lahore for an academic conference on inclusive education at the University of Management and Technology. I, along with another Indian friend, presented a paper there. I was thrilled but when I announced this news to Aliya, it turned out that she was far more excited about my visit. I was happy to get a chance to visit Pakistan but sad because my visa was restricted to Lahore, and Aliya lives in Islamabad. 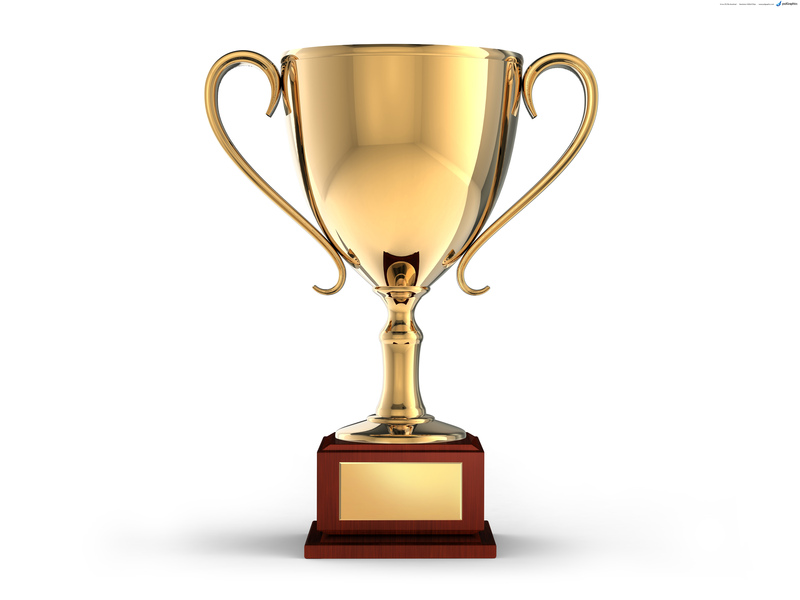 It was unbelievable when her immediate reaction was, “So what? I will come to Lahore to meet you.” We had already met twice in Delhi yet I was excitedly looking forward to meeting her in person, again. The first time Aliya came to India was in September’13 (exactly a month into our friendship) but she had a visa only for Chandigarh. We met in December of the same year at South Asian Peace Camp in Delhi. Aliya came to Delhi again in October’15 and March’16. While every moment spent in Lahore was memorable, those two days spent with Aliya were the best when I felt completely at home. Shopping at Anarkali bazaar was like shopping with my close friends at Lajpat Nagar in Delhi. 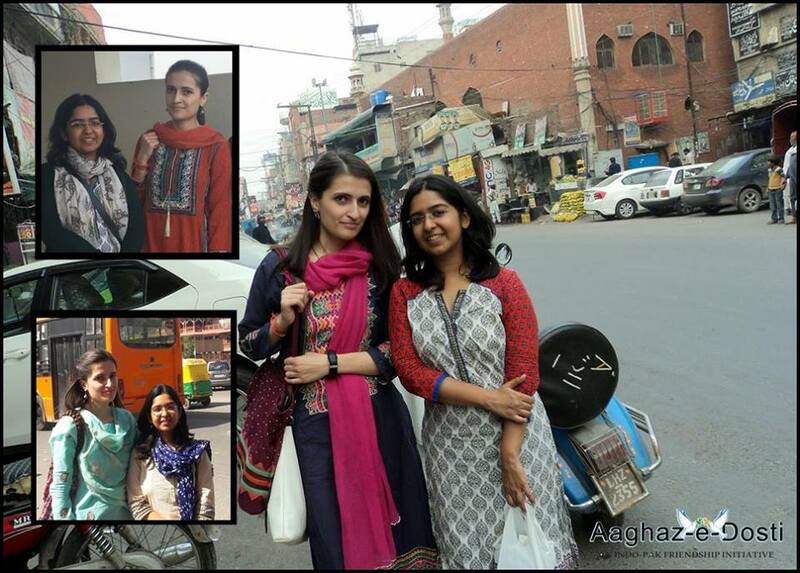 Sharing meals, exchanging laughter, discovering similarities, bargaining over prices at local shops, cracking jokes and roaming around Lahore became a journey of re-consolidating my belief that this conflict is futile, and the only thing that matters is my friendship with Aliya, a Pakistani. What brought us closer in this work was that we both were students and young professionals, striving to transform the #indopak conflict alongside our studies and jobs. Trying to explain my bond with Aliya seems quite weird to me. Can someone explain his/her bond with his/her close friend? That is exactly my situation. She is among my closest friends, and no border or political situation can affect our bond. The insane fight between India and Pakistan is definitely not my fight. In fact, through her, I have been able to understand how futile and constructed this conflict is. Not only our culture, language, challenges but even our politics is the same! I refuse to believe that loving India should mean hating Pakistan. I love India and I also love Pakistan because it is where my friends are. It is where Aliya lives. I was promoting my ‘Indo-Pak-Afghan Painting for Peace’ event on social media when I got a message from Devika. She sent a ‘hi’ followed by a note for collaboration. We jointly organized the event at in Delhi and at Islamabad which is how we became friends. This developed into online chats via Faceboook and WhatsApp, where we discussed our likes, dislikes, hobbies, movies, and dramas. I found Devika polite yet endowed with a good sense of humor. Our almost daily conversations triggered a switch from the use of ‘aap’ to ‘tum’ and then ‘tu’. Now we talk several times a day and exchange constant messages regarding work and other issues. It was through Devika that I came to realize how meaningless the animosity between the two countries is. 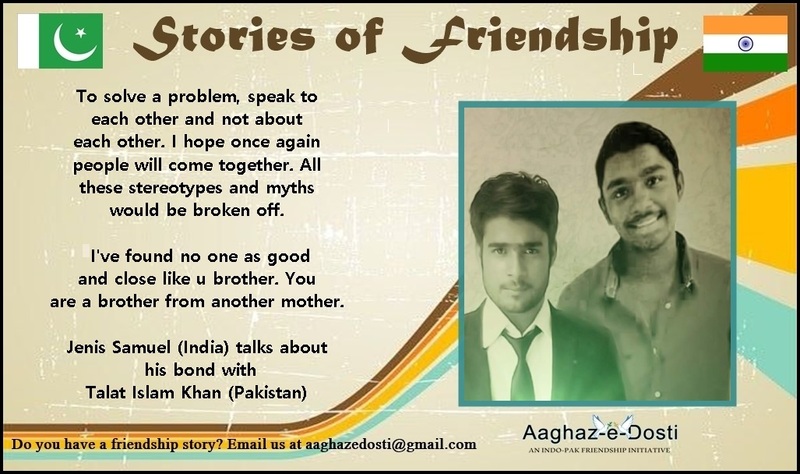 Working together at #AaghazeDosti has given us an opportunity to learn about each other’s culture and life. 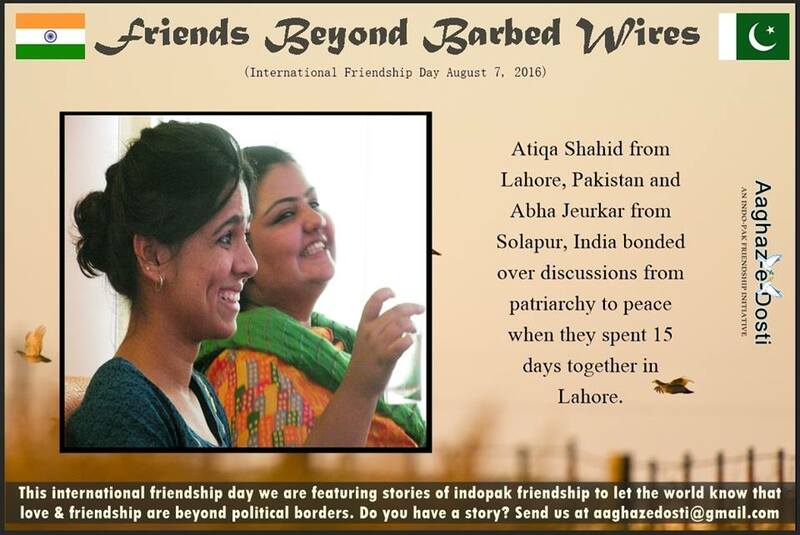 Barely a few months into our friendship, we met in Delhi when she invited me over for a peace camp in Dec’13. I found her no different than her virtual image. She is a blend of positivism, goodness, and simplicity. She graciously offered me a place in her home to live when I went to Delhi in Mar’16. Devika’s mother filled me with yummy’licious food from morning to evening the whole seven days. Living at my enemy’s home I could not feel happier, safer, and more contended. We speak regularly for organization and planning of cross-border events, in addition to the sharing of our daily life problems and concerns. On days when there emerges a tense situation between India and Pakistan, we know on one hand that this will lead to jingoism, but we also see it as our opportunity to work together more effectively to raise our voice for #peace. Nonetheless, we also drop sarcastic remarks to each other when the other team wins a cricket match. We like boasting about our cities, comparing them to cities on the other side of the border. We also engage in mutually fruitless exchange of remarks over which country has the best cities. I love generalizing that ‘Pakistanis are the best people on earth’, and she loves generalizing that ‘Indians are the best’ – of course all for the sake of fun. We do not believe in constructed differences, identities, or absolutes. Our faith is in a world that is beyond man made boundaries. This, I believe, is why I like Arjun Kapoor while she adores Atif Aslam. Devika is my ‘partner in crime’. Three years into our friendship, I have been telling her that Indians are evil. Of course, she has reciprocated. Always! She holds this evil smile that is so contagious. Once, I was going through a personal crisis, and had hit a low point in my life. Devika stood by my side as a true loyal friend. She did what she could do the best: samjhana-bujhana (helping me understand the situation), daantna (scolding), himmat barhana (motivating), honsla bandhana (affirming solidarity), and hansana (cheering me up) despite that she is a Ph.D. scholar, and her time is very important. Unless reminded by the visa restrictions, I have never had the feeling of Devika and me belonging to ‘rival’ countries. We share so much in common – our way of communication, humour, gaaliyaan (friendly abuses), feelings, and values. I have been to #India several times, and have developed hundreds of friendships, but the one with Devika is the most special and will always remain so. 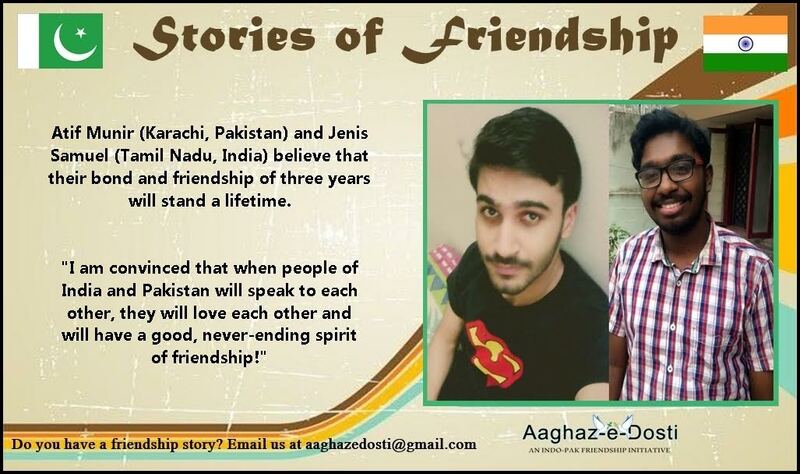 This story was originally posted as “Aaghaz-e-Dosti (Beginnings to an everlasting friendship)” on Friendships Across Borders: Aao Dosti Karein. 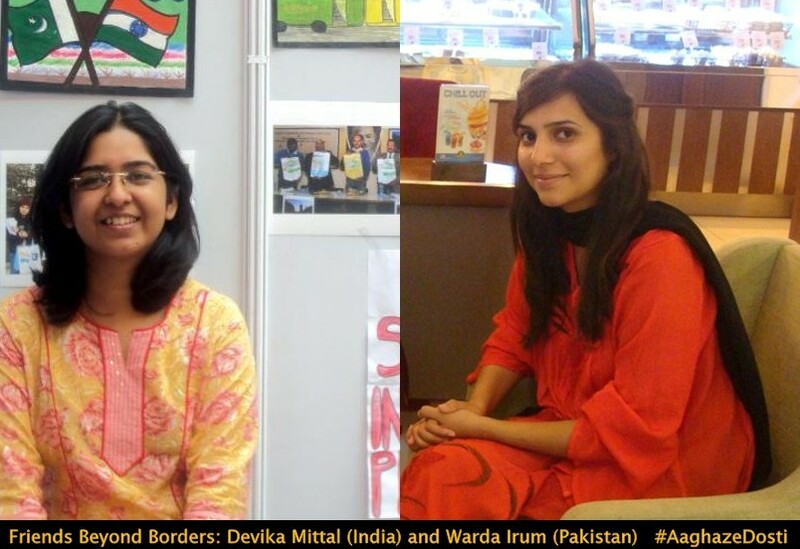 As part of our call to share about their friend(s) beyond the Indo-pak Border, Devika Mittal from Delhi, India shares about her bond with Warda Irum from Islamabad, Pakistan on the occasion of Warda’s birthday today. I came across Warda when she sent a greeting to Indians on Independence Day. I was touched by her message which was full of positivity and hope to begin anew. Weaved in through a beautiful poetry, it talked about the thorny border which exists not only physically and pains us but which is also drawn in our minds and hearts. We can only undo the past of hatred by realizing and diminishing the thorny border that exists in our minds. I was touched by her beautifully written and thought-provoking poem and connected with her through facebook. I continued to learn through her posts that would challenge constructed hatred, misogyny, bigotry and pseudo nationalism that directs us to accept the evils, gloss over them when they actually stand against the spirit of the vision of the national leaders. Her posts were a source of information about a side of Pakistan that we hardly ever come across and recognize. They also taught how we are really the same people as her posts were as relevant to Pakistan as for the situation in India. Besides the posts, whenever I interacted with Warda, I found her as amazing as her thoughts. Whenever I talk to her, I feel as if I am talking to an old friend, to someone I know for long and too much, and with whom I am so comfortable. She is a wonderful person, amazingly friendly and sweet. Like my other close friends in Pakistan, I hardly remember her identity as a “Pakistani”. Infact, our friendship is quite dangerous as it is challenging the stereotypes, the constructed notions. Warda is one big challenge to the idea of Pakistan as our “enemy country”, to the idea of Pakistan as a country which is completely opposite and opposing. The only time I am reminded of her identity is when I think of the distance between us, of the “thorny border” that physically exists.